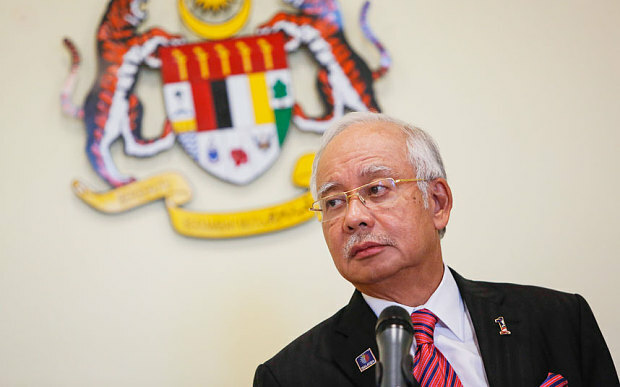 For Najib Razak, the Malaysian prime minister beset by controversyover nearly £450 million paid into his personal bank account, the timing of a global anti-corruption conference in Kuala Lumpur next week could not be more awkward. The embattled leader has now quietly cancelled his scheduled speech to 2,000 delegates on the opening day of the International Anti-Corruption Conference that his country is hosting. The summit, which is organised by the Transparency International, the world’s leading anti-corruption organisation, is held every two years in different locations. By chance, it will open in Kuala Lumpur as Mr Najib’s government is engulfed in allegations of corruption and financial impropriety surrounding 1Malaysia Development Berhad (1MDB), a scandal-plagued state investment fund. The prime minister has strenuously denied any wrongdoing connected to the payments into his bank account or to 1MDB, which that has amassed debts of £7 billion since he founded it in 2009. The prospect of the prime minister addressing the conference had delighted critics who are demanding his resignation. His office has not explained why he is now sending along a junior minister in his place. “It’s standard protocol of the International Anti-Corruption Conference to have the democratically elected head of state open the conference,” said Chris Sanders, Transparency International’s spokesman. Mr Najib pulled out of the summit as tens of thousands of protestors prepare to stage anti-Najib rallies in Malaysian cities this weekend. The protests are going ahead despite threats by police to arrest organisers as the gatherings do not have permits. The scandal swirling around 1MDB took a new twist last month when it was reported that financial investigators had found a payment of nearly £450m into Mr Najib’s bank accounts. The country’s anti-corruption commission said that the money was contributed by an unnamed donor, not by 1MDB, but officials said they were still investigating. Mr Najib’s officials have said that the payment of nearly £450m, made through an Arab bank, came from a Middle East benefactor for political party use purposes before the last election. Mr Najib has denied any personal financial gain. But the contribution of such a large sum – nearly as much as the £470m raised by Barack Obama to fight the 2012 US presidential campaign in the most expensive election in history – has only fuelled controversies. Mahathir Mohamad, the former Malaysian prime minister who was once Mr Najob’s mentor, has been among the most vocal critics questioning the donation and leading calls for his resignation. Mr Najib has accused Mr Mahathir of leading a conspiracy to oust him. His government has also said it is the target of a plot involving Clare Rewcastle Brown, the sister-in-law of Gordon Brown, who runs Sarawak Report, a London-based anti-corruption website. As the scandals deepened, Mr Najib sacked his deputy prime minister and other Cabinet members who did not stick to the party line and replaced key anti-corruption officials. With his government battered at the same time by economic woes as falling oil prices have pushed the ringgit currency to a 17-year-low, there has also been a crackdown on opposition media. Malaysia on Thursday announced that it will block websites supplying information about and encouraging participation in the the protest rallies. The home minister had earlier said that the organisers from pro-democracy group Bersih were spreading "anti-government propaganda" that damaged the country's image and hence was a threat to national stability.